How can I setup new Roles for my hotel users ? HOME > SETUP AREA > How can I setup new Roles for my hotel users ? The hotel can setup a Role for each User. The role will restrict specific areas for the user to access to. STEP 1: First you need to click on SETUP on the right top area. 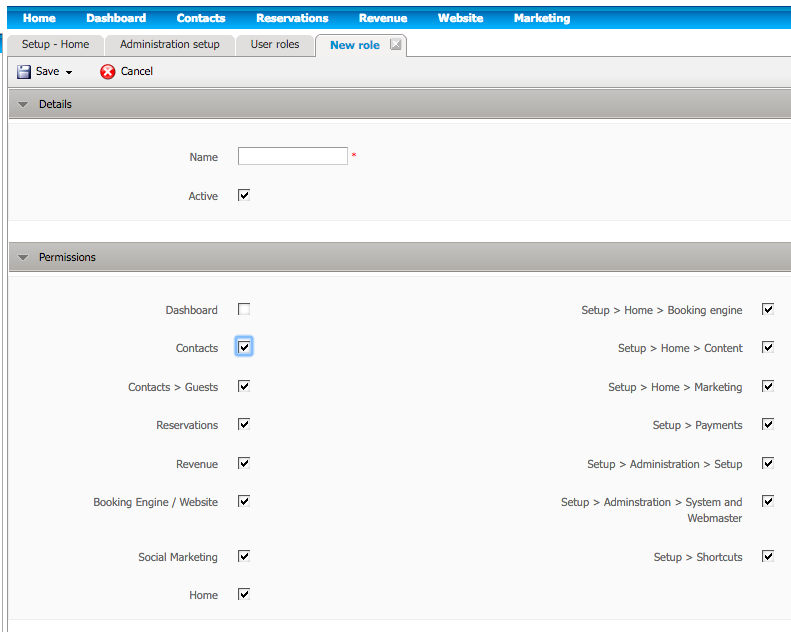 STEP 2: On the left Navigation Panel, click on Administration and click on USER ROLES icon. STEP 3: Click on New Role button. Role Name: create the name for the specific user. Permissions: select the areas you wish your User will access to. STEP 5: After all details added, click on Save button and select Save and Close. the New Role user permissions will be created and listed. This new Role will be available when creating/ editing an User.